Head-on Collision on 190 East Sends Livingston Man to Hospital, LIVINGSTON, April 5, 2008 - According to DPS Trooper Darwon Evans an accident occurred on Highway 190 East 13 miles out of Livingston. Shortly after 10 pm on April 5, 2008, a black 2006 Mitsubishi Gallant driven by Ryan Alec, 22, of Livingston was east-bound on 190 and a white 1998 Plymouth Grand Voyager driven by Ronnie Smith, 24, also of Livingston, was west-bound on 190. According to Trooper Evans, Smith crossed over the center line and a glancing head on collision occurred between Smith and Alec. The impact of the collision spun both vehicles around in the opposite directions that they wer traveling in. The mini-van came to a rest in the grass on the east-bound side of the road more than 50 yards away from the point of impact and facing east while the Mitsubishi came to a rest in the middle of the higway facing west. Airbags in both vehicles deployed. Alec was transported to Livingston Memorial Hospital via Americare Ambulance Service. 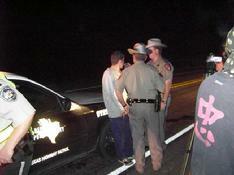 Two DPS Troopers (Sam Lattner and Darwon Evans) investigated the scene of the accident. According to the troopers, both Smith and Alec had their seat-belts fastened. The Alabama Coushatta Volunteer Fire Department arrived on the scene to help clear the wreckage. Traffic at both ends of the scene on 190 was completely blocked as emergency personnel tended to the scene of the major accident. There was also Polk County Sheriff's deputy at the scene. Smith was not only at fault in the accident, but is also on probation, which has been revoked and a warrant was out for his arrest for violating the rules of his probation. Smith is on probation for intoxicated assault with a vehicle. There was a rollback wrecker from McKENzie's Wrecker Service which towed both vehicles. It is not yet known if either of the drivers had insurance. At time of press, no citations have been issued as the accident is still being investigated by DPS.